Fifteen countries host some 6,500 megawatts of offshore wind capacity. Before the year is out, the world total should exceed 7,100 megawatts. Although still small compared with the roughly 300,000 megawatts of land-based wind power, offshore capacity is growing at close to 40 percent a year. In 1991, Denmark installed the world’s first offshore wind farm, a 5-megawatt project in the Baltic Sea. 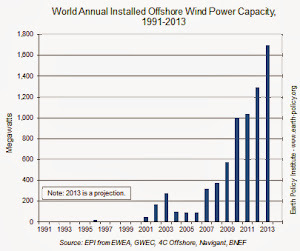 The country’s offshore wind sector has since alternated between lulls and bursts of activity. Since 2008, Denmark’s offshore wind capacity has more than tripled, topping 1,200 megawatts by mid-2013. Over 350 megawatts of offshore wind power were plugged into the grid in the first half of the year—all of it to complete the 400-megawatt Anholt project, which is expected to meet 4 percent of Danish electricity needs. Denmark already gets more than 30 percent of its electricity from wind—onshore and offshore—and aims to increase that share to 50 percent by 2020. At about one third the size of New York State, Denmark has the world’s highest wind power capacity per square mile, so it will rely mostly on offshore expansion to hit the 2020 target. Denmark was first to put wind turbines in the sea, but today it ranks a distant second to the United Kingdom in total offshore wind generating capacity. More than 500 megawatts of new offshore wind power went online in U.K. waters in the first half of 2013, bringing the country’s grand total to over 3,400 megawatts—enough to power more than 2 million U.K. homes. The bulk of this new offshore capacity went to completing the 630-megawatt first phase of the London Array, now the world’s largest offshore wind farm. It overtook another U.K. project, the 500-megawatt Greater Gabbard wind farm, which was finished in 2012. In all, the United Kingdom has some 12,000 megawatts of offshore wind capacity under construction or in earlier development stages. Belgium’s offshore wind capacity grew 20 percent to 450 megawatts in the first half of 2013, placing it third in the world rankings. Germany reached 380 megawatts of offshore wind and will have at least 520 megawatts by year’s end. Beyond this, the German offshore industry expects another 1,000 megawatts will connect to the grid in both 2014 and 2015. Countries in Asia are starting to make offshore wind power more than just a European affair. China, for example, brought its first offshore wind farm online in 2010. Since then, China has quickly climbed to fourth in the world, with 390 megawatts. The official goal is for 5,000 megawatts of wind capacity in Chinese waters by 2015, ballooning to 30,000 megawatts by 2020. In Japan, where land is at a premium and where the future of nuclear energy is in question, offshore wind is gaining attention as a potentially huge domestic, carbon-free power source. A 16-megawatt project inaugurated in the first half of 2013 bumped Japan’s offshore wind capacity to 41 megawatts. Because Japan lacks much shallow seabed in which to fix standard offshore turbines, new floating turbine technology is likely the future for offshore wind there. Off the coast of Fukushima prefecture, a 2-megawatt floating turbine will begin generating electricity in November 2013, the first stage of a 16-megawatt demonstration project. If it performs well, the hope is to expand the project’s capacity to up to 1,000 megawatts by 2020. Floating turbines may actually be a big part of future offshore wind development at the global level. Not only do they greatly expand the area available for wind farms, they also have the potential to dramatically reduce the cost of offshore wind generation, which today is more than twice as expensive as that from turbines on land. While offshore wind manufacturers have managed to achieve cost reductions for the turbines themselves—through lighter, stronger materials and increased efficiency, for example—these savings have thus far been offset by the rising cost of installing and maintaining turbines fixed to the seabed as projects move into deeper waters. The renewable energy consultancy GL Garrad Hassan notes that working around harsh weather becomes much easier with floating turbines: when conditions are favorable, relatively cheap tugboats can bring a turbine to the project site for quick installation, avoiding the need for specialized installation vessels. The turbine can be floated back to shore when the time comes for maintenance, lowering both cost and risk. The world is gaining experience in using this young technology. In the last few years, Norway’s Statoil and Seattle-based Principle Power have both deployed floating wind prototypes successfully, in Norwegian and Portuguese waters, respectively. In June 2013, the United States at last joined the offshore wind club when a 20-kilowatt (0.02-megawatt) floating wind turbine anchored off the coast of Maine first sent electricity to the state’s power grid. The turbine developer, DeepCwind, a consortium led by the University of Maine, plans to deploy two much larger versions, 6 megawatts each, in 2016. The first full-fledged offshore wind farm in the United States, though, will likely be of the traditional variety fixed to a foundation in the seabed. Three proposals—Massachusetts’ 470-megawatt Cape Wind project, Rhode Island’s 30-megawatt Block Island Wind Farm, and New Jersey’s 25-megawatt Fisherman’s Energy I project—are the closest to beginning construction. 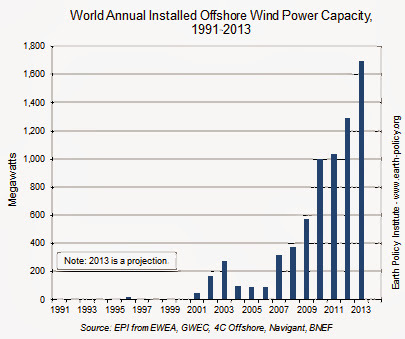 U.S. offshore wind’s potential is staggering. According to the U.S. Department of Energy, shallow waters along the eastern seaboard could host 530,000 megawatts of wind power, capable of covering more than 40 percent of current U.S. electricity generation. Adding in deeper waters and the other U.S. coastal regions boosts the potential to more than 4.1 million megawatts. This is consistent with the findings of a 2009 Harvard study that calculated wind energy potential worldwide. The authors estimated that in most of the world’s leading carbon dioxide-emitting countries, available wind resources could easily meet national electricity needs. In fact, offshore wind alone would be sufficient. Clearly, the world has barely begun to realize its offshore potential. Indeed, in some countries, regulatory and policy uncertainty seem to be sapping offshore wind’s momentum just as it really gets going, clouding the picture for future development. The U.K. government, concerned about costs, recently changed its target date for 18,000 megawatts of offshore wind from 2020 to 2030. In Germany, turbine orders are scarce as developers await the new coalition government’s plans for regulations and incentives. And in China, offshore wind companies say the guaranteed price for the electricity they generate is set too low to stimulate rapid growth, calling into question whether the country can hit its ambitious goals for 2015 and 2020. 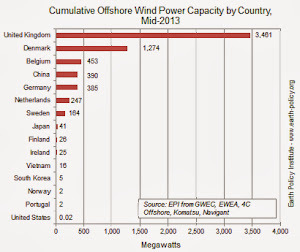 Reflecting the hazy outlook in these and other key countries, projections for global offshore wind capacity over the next decade or so—from research and consulting firms and from industry publications—range anywhere from 37,000 to 130,000 megawatts. Despite the impressive growth of recent years, it seems that the lower end of these forecasts is much more likely. We know there is practically no limit to the available resource. What remains to be seen is how quickly the world will harness it and give offshore wind power a more prominent place in the new energy economy. For more information on wind power, see “After Record 2012, World Wind Power Set to Top 300,000 Megawatts in 2013,” by J. Matthew Roney, at www.earth-policy.org. Reinventing Fire: Bold Business Solutions for the New Energy Era offers market-based, actionable solutions integrating transportation, buildings, industry, and electricity. Built on Rocky Mountain Institute's 30 years of research and collaboration in all four sectors, Reinventing Fire maps pathways for running a 158%-bigger U.S. economy in 2050 but needing no oil, no coal, no nuclear energy, one-third less natural gas, and no new inventions. This would cost $5 trillion less than business-as-usual—in addition to the value of avoiding fossil fuels' huge but uncounted external costs.